“Super Sunday” is almost here, and while many people are planning Super Bowl parties and looking forward to an exciting game, engineers with the University of Virginia’s Center for Applied Biomechanics and a UVA spin-off company, Biocore, will be watching with a particular degree of insight, focused on safety. 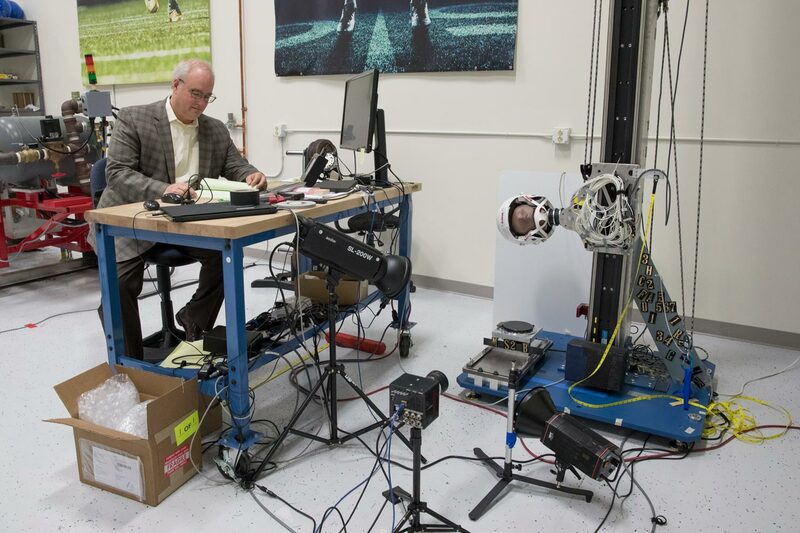 For a decade now, research teams led by crash test experts Jeff Crandall and Richard Kent, both UVA engineering professors, have been conducting safety research for the National Football League. They serve on NFL committees and panels and their research informs equipment innovations and safety rules. Q. How did the Center for Biomechanics get involved with doing research for the NFL? A. Our background is in automobile safety research, and so for years we’ve studied how the human body reacts under impact, and we’ve developed test dummies and computer models. As a result of this work, the National Football League approached us about 10 years ago, specifically to work on the problem of lower-limb injury in football using the techniques and tools we developed. This initial work involved evaluating football shoes and shoe/turf interactions, with the goal of enhancing player safety. Now we do a little bit of everything for the league, working on player protection from head to toe. Q. What are some of the types of studies you now do for the NFL? A. We continue to do annual evaluations of footwear, and we have expanded to evaluating padding – thigh, knee, shoulder and hip pads, as well as helmets. As we do this, we’re always developing new approaches, tools and techniques for evaluating the safety of equipment. As an example, when we started out evaluating shoulder pads, we did it from the standpoint of looking at how this equipment protected the wearer. Now we look at it in terms of not only wearer protection, but also how the design can improve the safety of opposing players who come into contact with shoulder pads during impacts. Regarding concussions, over the years we have seen shifts in the scenarios causing injury as a result of rule changes implemented by the NFL to reduce helmet-to-helmet impacts. Twenty years ago, two of every three concussions involved helmet-to-helmet impact. Now, only a little over a third of concussions involve helmet-to-helmet impacts, but now roughly a quarter involve helmet-to-shoulder impacts. So, we are focusing now on how to engineer shoulder pads that are safer for a player impacting that pad with their helmet. We conduct annual evaluations that rank the safety of shoes, padding and helmets that we present to the league and the players’ association. The results of these studies are placed in the locker rooms of every team to help players make safer choices regarding their personal equipment. Q. In what ways are your studies helping the league make safety rule changes, and equipment manufacturers better gear? A. Regarding footwear, there’s an annual evaluation and safety ranking of the different models and brands available to players. As a result, some cleat designs that don’t release in turf traction tests, which is a safety issue, are pulled by the manufacturer, even in mid-production. We’ve seen advances in the safety of shoes as manufacturers incorporate research and learnings from these studies into their designs. 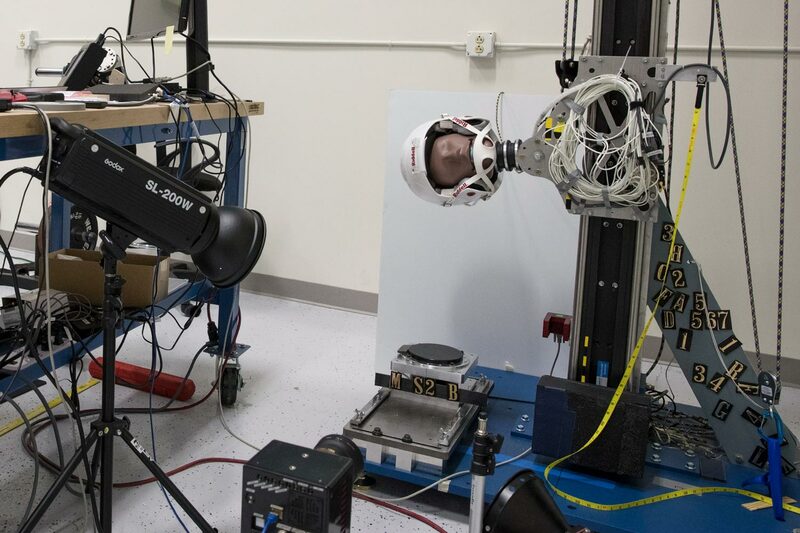 With helmets, we conduct annual tests to see how well the models mitigate the forces and accelerations that can result in injury to the head. We then put out a poster that ranks helmet performance that hangs in every NFL locker room. In parallel with the annual evaluations, the NFL sponsors innovation challenges that award funding to inventors and companies who are developing products to improve player safety. Over the next few years, we will have data and research that should support not only the development of better all-purpose helmets, but also position-specific helmets. The NFL employs an injury-prevention strategy using “the three E’s”: Engineering (better equipment and playing fields), education (helping players select the safest equipment) and enforcement (of safety rules and implementing new rules, based on safety studies). We’re trying to develop a better understanding of the forces and accelerations that players experience, and through our studies we collect information on the mechanisms of injury, and the types of plays and player actions that can result in injury. What we learn goes into the engineering of safer equipment, player education in terms of both equipment selection and in learning to reduce behavior that can result in injury, and, likewise, these studies inform the league’s rule implementations and enforcement of those rules. We provide the biomechanical and scenario information that can be used to reduce injury in numerous ways on many levels. None of this is a static process; injury protection is a continuous process. The NFL has made nearly 50 or so rule changes in the past 15 years to reduce injury, based on studies such as ours. In turn, the manufacturers are making better, safer equipment, and the players are educated on the risks of different types of play. We’re constantly studying and reassessing in this ongoing process. Q. Can these studies for the NFL translate to everyday life for the rest of us? A. Most of the impact forces, the masses, the velocities that we deal with are NFL-specific. But if you look at some of the fundamental things we’re doing, like studying accelerations and velocities and rotations that can result in concussions, it’s fundamental research that is applicable not only to football, but also to other sports, automobile safety, the military and a range of other areas. We’re also learning how advanced materials and designs can better absorb energy and ultimately enable safer equipment. These advances transcend football and even sports. Q. Will you be watching the Super Bowl this Sunday? And what will you be seeing that many fans won’t notice? A. I’m fortunate that because of my work, I’ve been able to attend the Super Bowl the last couple of years, and I’ll be going again this year. One thing, because we do so much helmet research, I scan the field for every helmet make and model that the players are wearing. And, from the standpoint of studying player injuries and the scenarios that can result in injury, I can’t help but do a risk assessment in the back of my head when someone is hit or goes down. I don’t know from a fan-experience standpoint if that helps my enjoyment of the game, but I can say I’m very engaged in what happens in every play.